Manufactured home with $1,525 a month land lease, upgraded, sunset views with 3 bedrooms, 2 baths, 1482 Sq Ft, located in Canyon View Estates in an upper view lot with no front or back neighbors! 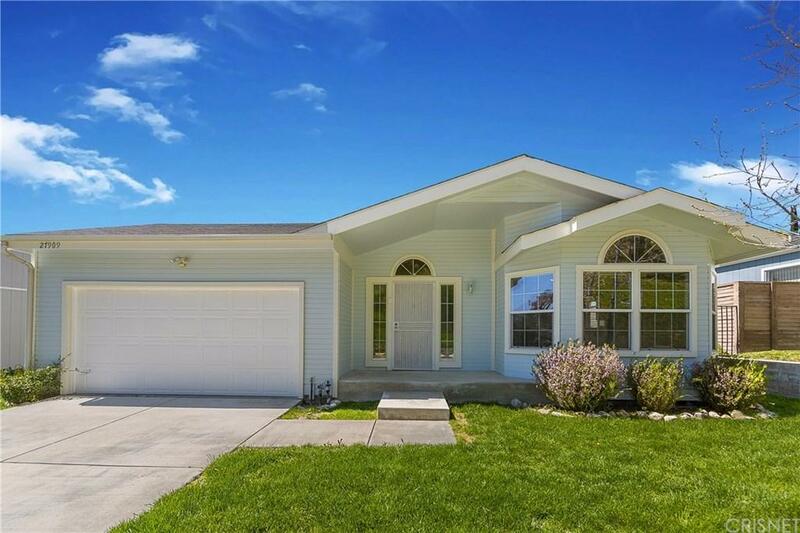 This move-in ready home is light and bright with new paint and flooring throughout. The living room has a beautiful bay window and fireplace. The kitchen is upgraded with granite counter tops, new stove, and lots of storage. The master bedroom has an en-suite bath with double granite sinks and a relaxing soaking tub. Sliding doors open up to 2 separate patios with million dollar views of Santa Clarita. Amenities include 24-hour guard gated security, 2 pools, basketball and tennis courts, children's playground, recreation room with kitchen, maintained greenbelt and hillsides. Near Discovery Park with walking and biking trails, entertainment, shopping, and schools. No HOA or Mello Roos! Canyon View Estates is a land lease community with the land lease currently at $1,525/month. This spectacular home will go fast!